No two resumes are alike, even if they use the same kind of formatting. In the ten resume examples listed below, you'll see some similarities, but lots of diverse methods to showcase skills and proficiencies. Review each one and then see what elements you can incorporate into your own resume. This is an impressive example for a computer scientist position. As you can see, every category is carefully displayed under separate subsections. Previous work experience is highlighted with a block graphic on the left-hand side. This element makes it very easy for the HR manager to review the candidate's past employment history. Technical skills are in a second column on the resume and are categorized according to the general description of the skill. Again, this makes everything easier for the HR manager. In fact, this organization allows the manager to quickly move to the skills category, which they'll be the most interested in to review the candidate's abilities. Since HR managers have a lot of resumes to sift through, having your important information ready at a glance can make you stand out. Soft skills are also highlighted, but in a different way. They're featured in a button-style background of color with white text for emphasis without taking up too much space on the one-page resume. Finally, another standout feature here is the use of icons next to the list of extra-curricular interests. Overall, this resume is a perfect example of someone who is adept with computer science and in-step with modern graphic interface techniques. It can be challenging for a recent high school graduate to come up with a viable resume. This is especially true if there is no previous job experience. This example solves that problem. In the header, the graduate has made a color block that contains his basic information, including all his contact information. This effectively helps the hiring manager get an overview of the person without even having to delve into more details. The body of this application, however, is where this example really shines. The first section lists the general skills of the graduate. What's impressive about this layout is that the graduate had the foresight to separate his skills into categories that are easily read. Naturally, a recent graduate needs to list his education degree, so this section is pretty standard. The next two sections are particularly great if you are a recent high school graduate with no paid employment history. First, listing your achievements is a great way to make yourself stand out from every other high school graduate. Second, listing volunteer experience lets the hiring manager know that although you haven't had formal employment in the past, you do understand the responsibilities of working in a professional environment. Military personnel often have a rough time of trying to find gainful employment when they return to civilian life. They may have acquired numerous valuable skills during time served, but it can be hard to explain how that training and skills translate to the business world. This resume does an excellent job of doing just that. To begin, this candidate is applying for a job as security personnel. That helps tremendously, since it's not a far stretch from working in the military. General skills are highlighted with low-key graphic "buttons" that mention relevant skills. Note that although this candidate may have tactical training in weapons or communications, he doesn't list it here. That would just muddy up the message and take the focus off the relevant skills for this job. Next, the phrase "areas of strength" is an interesting choice of words. Obviously, strength is a desirable characteristic in a security guard. This is a subtle and strategic word choice that can make the hiring manager lean toward making a job offer. Moving down to the personal achievements section, this example is powerful because it stands as a testament to the outstanding personal character, bravery, and trustworthiness of this individual; all qualities you'd want in a new security guard. Here's an example for a teacher that you need to see. The summary at the top in the color block acts as a kind of mission statement. It briefly explains the teacher's classroom methodology. This speaks to the professionalism of the candidate as well as her level of experience. A junior teacher or someone who just graduated wouldn't be able to make any of these claims. The applicant further breaks down their extensive teaching experience into digestible bullet points, as with the other subsections. This confirms that the teacher understands how to present information in an organized, easy-to-understand fashion; something a quality teacher would do. Teaching certificates are listed last since they are an obvious requirement, but don't necessarily make the candidate stand out. Instead, the standout qualifications—namely the extensive volunteer experience—is front and center, communicating to the hiring manger now that this candidate is dedicated to benefiting others. You can make a strong impression on the hiring manager by opening your application with this example. This job candidate has chosen to highlight her skillset across the top of this example. Each of the skills listed is relevant to working as a cashier; more importantly, the skills indicate a profound knowledge of what is needed to be a successful cashier, such as accuracy, a positive attitude, and efficiency. The work experience history is laid out in an easy-to-read manner. Specific job duties are noted with a short dash. The applicant doesn't go into specifics, knowing that the interviewer will ask questions about anything they want to learn more about. Another notable feature of this example is that the dates of employment are listed, but only in a small, italicized, and light font color. This formatting makes everything look less cluttered while still including relevant information that the hiring manager might be looking for. Two features really stand out about this architect example, which is clever and professional. The first notable feature is that the architect chose to include a picture at the top of this example. This is a non-traditional approach, but in this case, it works. If you feel comfortable including your photograph, there's no reason you shouldn't do so. However, if you do decide to, be sure that you use a professional photograph only. You wouldn't want to include anything that resembles a selfie or a picture where you've cropped your face out of a group shot. The second notable feature of this architect resume is the use of "building blocks" to indicate the level of proficiency for the given skills and languages. This is a creative tactic to use and it's relevant to the job being applied for. Whenever you can demonstrate your relevancy to the job without using words, like in this example, it's a good idea to do so. Just don't try to get too cutesy or obvious with your strategy. An application for a data analyst is naturally going to be more complex than other varieties. There's a lot of information to include in a small amount of space. Typically, you only want your resume to fill the equivalent of one sheet of paper. In this example, the candidate makes use of color as well as bolded and enlarged fonts to distinguish headers from the rest of the content. Technical skills are placed above work experience, as this is the criteria that the candidate will be most judged on. Work experience comes next, and the descriptions are kept extremely short and straight to the point. In a striking example of what not to do, the candidate lists just one contact person out of two past employers. It's almost like she doesn't want the hiring manager to inquire about her first job for some reason. If you're going to include a contact person, then do it for all your past employers Otherwise, leave it off all together. Finally, at the end of this data analyst example resume, the candidate lists her professional certifications, where she got them, and when she got them. This is something that will always impress a hiring manager enough to grant an interview. This application for a business development manager is an excellent example of a two-column layout. According to recruiters, resumes for business-related jobs should always highlight accomplishments. As this document demonstrates, the best place to do just this is under the title of "Work Experience." This is the best place to discuss specific examples of how you provided value for the company in your role. Another feature that employers like to see on a business resume is a list of any organizations that you may belong to, as well as any honors or awards that you have received. Finally, if you have been an attendee of any conferences courses, as this candidate has, it's appropriate to list them. Nurses have a wide variety of job responsibilities and tasks to perform on a daily basis. As such, it's impossible to include everything that you may have done as a nurse on your resume. However, it is important to go into a little bit of detail so that the hiring manager can see how you stand out from other nursing applicants. It's a fine line to tread. 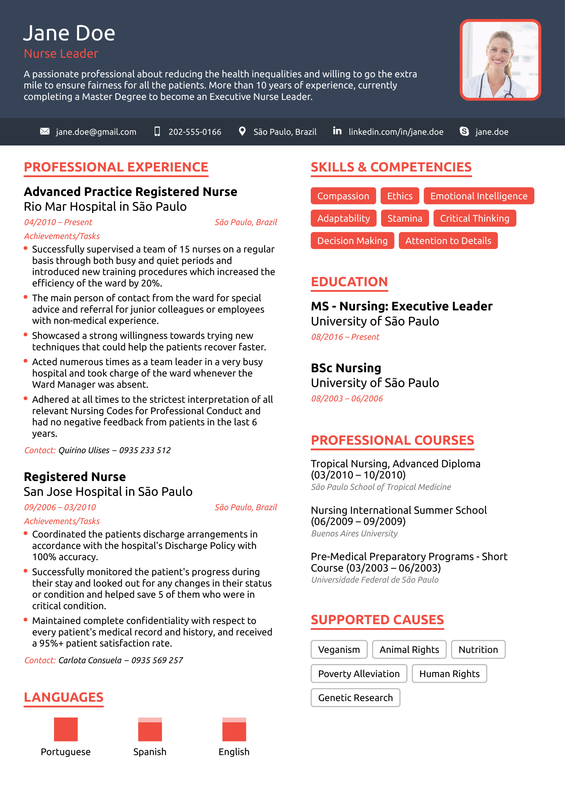 As you can see from this example nurse resume, the candidate does a good job of including specific information from past employment without overloading and cluttering the resume with minor details. And, because this candidate uses the two-column layout, she's able to focus on her skills and professional coursework without detracting from her employment history. Another tough application to put together is one for a bar manager. The challenge lies in how to convey a breadth of knowledge and skills without having to list of all the drink recipes you have memorized. The key to an effective bar manager application is bearing in mind the real job responsibilities. Then, focus on highlighting those skills on your application. Bar managers need to take accurate inventory, direct staff, manage customer services, and oversee product quality and waste control. This example bar manager document does all of that and more. First, since the bar manager has extensive customer exposure, it makes sense to include the photograph. The skills are highlighted in the second-column with a simple bar graph indicating the level of proficiency. Finally, the other stand-out feature is that he brings attention to his previous bar managerial experience with a simple little line graphic on the left-hand side. This little detail brings the hiring manager's attention to the fact that this candidate has already held this exact position before. There's little doubt that a resume like this will garner an interview.